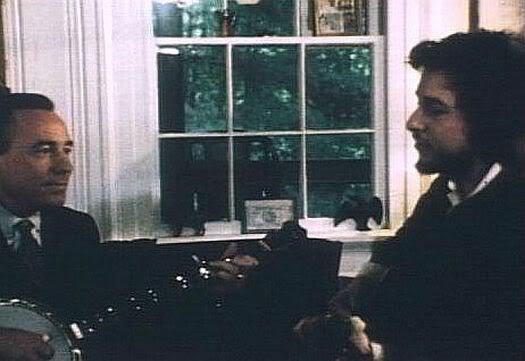 There’s not much video of Bob Dylan from 1970, because he barely appeared in public, with the exception of receiving an honorary doctorate from Princeton in June. He played no shows at all, and the only real document of his playing that year other than his two albums (and the recently released Bootleg Series album) is his appearance in a documentary about the great banjo player, Earl Scruggs. Dylan recorded two songs with Earl and two of Earl’s sons in December 1970, and the film was released in 1972. It’s available on YouTube (below) and the whole thing is really worth watching. The Dylan parts – “East Virginia Blues”, a traditional tune, and “Nashville Skyline Rag” – are the first two things on the video if you only want to see his part. Of course if you turn it right off you’re missing out on Scruggs at the home of Doc Boggs, and it really just gets better from there. Scruggs was an amazing musician and his influence on banjo may be stronger than any other musician’s influence on the playing of any other instrument. To say that almost all bluegrass banjo players fashion their playing style after Scruggs is an understatement. The first time I attended American Banjo Camp, which has more bluegrass players than clawhammer players (the style I play), I innocently asked someone at lunch why all the bluegrass players use two metal finger picks and a plastic thumb pick (why aren’t they all metal?). He stared at me dumfoundedly and said “that’s what Earl uses”, like I had just fallen off the back of a turnip truck. “That’s what Earl does” was all the reason any banjo player needed for any decision they made, and the desire to achieve the Scruggs sound is powerful among amateur players. For much of the 1960s Scruggs and Dylan would have been seen as occupying enemy camps, and indeed many might see them as such even today. Their playing here is great, even if on his own composition Dylan has an intimidated look in his eyes that says “man, this guy is a real player!”.